Most of us never think about home care services until we or someone we love needs them. In the meantime, we probably have heard some false stories. Unfortunately, those are the ones that make the news – not the millions of others that are handled with love, compassion and diligence. 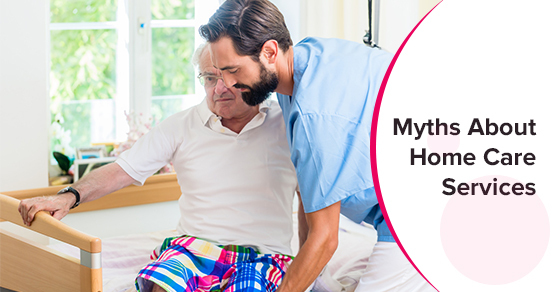 If you are facing the need for a home care services agency, let us help you rest easy about what lies ahead and separate the myths about home care services from the reality. You are justified to be wary of having a stranger enter your parent’s home. Will they be honest? Will they have the personality to deal with my loved one’s issues? The fact is, a home care services agency will coordinate with you to find someone with the right personality and temperament. They will analyze the needs of your loved one, and find a caregiver suited to their individual requirements. If for some reason there is an issue, call the agency immediately. This is so-not-true. Home care services run the gamut of short term help after an accident, needing assistance with shopping and light housecleaning, simple companionship a few hours a day, to full time personal care 24 hours a day. Many people believe this myth. Sometimes your loved one resides in a nursing home or senior community, but they need that extra care. Perhaps it is bathing, grooming and dressing each morning. Maybe they need a companion for grocery shopping. Whatever their requirements might be, you can utilize the help of a home care services agency. Instances of carelessness are miniscule compared to overall home care services. Look carefully and you will find those scenarios occur with unskilled, independent so-called caregivers who are not associated with a reputable health services agency. Do your own homework before you hire any caregiver. Be sure the agency is bonded, licensed and workers are certified personal support workers, Registered Nurses (RN) or (RPN) Registered Practical Nurses. A trustworthy agency will screen and insure their all caregivers. Many people mistakenly believe that if they hire a home care services they must “buy it all.” They think this means all day care for every activity. This is certainly not the case. When you engage a home care services agency YOU decide what services your loved one needs. You decide on the number of hours, the exact services, and have input on the caregiver themselves. Don’t buy into all the myths surrounding home care services. Your loved one can enjoy their senior years with compassionate comprehensive care at home. Contact C-Care Health Services to inquire about our affordable home care services for your loved one.